1996-97 Topps Finest Basketball is highlighted by an extremely strong rookie class. While it's relatively free of inserts, the set isn't as straightforward as it seems. A three-tiered base set make it extremely challenging to complete. 1996-97 Topps Finest Basketball came in two series. The first has numbers 1 to 146. The second series runs from numbers 147 through 291. Both sets have bronze, silver and gold cards. These aren't parallels. Rather, they're short prints, some of which are more rare than others. When the set came out, collectible card games, like Magic the Gathering, were really starting to take off. Several sports cards sets took a similar approach to releasing common, uncommon and rare cards. 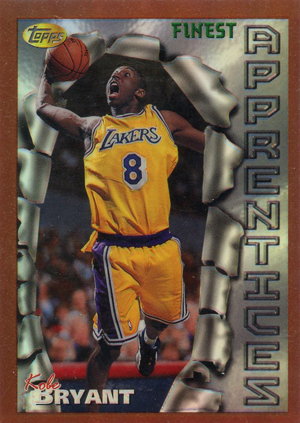 For 1996-97 Topps Finest Basketball, bronze cards are considered common. Silver cards, which fall every fourth pack, are uncommon. Gold cards, inserted one per box, are rare. Adding to the tiers are the Refractors. Parallels for the bronze cards are the easiest to find at 1:12 packs. Every other box has a Silver Refractor. Gold Refractors are considered a case hit at 1:288 packs. 1996-97 Topps Finest Basketball doesn't have one distinct design. All cards are part of themed subsets. For Series 1, they're Apprentices, Gladiators, Maestros and Sterling. Series 2 subsets include Foundations, Heirs, Mainstays and Sterling. Because of this structure, many players have multiple cards in the set. Cards come with a clear film intended to help protect card surfaces. The film could be peeled off relatively easily. This creates a dilemma for collectors, though. Do you keep the film in tact, even though it doesn't look as nice? Or do you peel it, risking damage as you lift the film up for the first time? As far as secondary market values go, there is no major difference. However, when sending the cards in to be graded, they will look at the surface. If the protector shows scratches, this will lower the final grade, even if the card underneath has a perfect surface. Rookie cards in 1996-97 Topps Finest Basketball include Kobe Bryant, Steve Nash, Allen Iverson and Ray Allen. The strong crop also has several second-tier players like Jermaine O'Neal, Derek Fisher, Marcus Camby and Stephon Marbury. Most rookies have multiple cards in the set, however the official rookie cards are nearly all found in Series 1 packs as these were the first. Vitaly Potapenko is the only Series 2 rookie card. Both 1996-97 Topps Finest Basketball Series 1 and Series 2 boxes come with 24 packs of six cards. Cards 7 and 134 do not exist. Christian Laettner (Bronze), Patrick Ewing (Gold) and Jeff Hornacek (Gold) all number 136. 1996 97 Finest Factory Sealed Basketball Box Hobby Mint! KOBE RC SERIES 1 NOT 2!